Good Morning & Happy Saturday!!! Well, today is a bit sad for me because this will be our last official Etsy Challenge! I have truly enjoyed being a part of this awesome team of extremely talented ladies but it was decided that it was time to move on....my Saturdays will NEVER be the same!!!!! 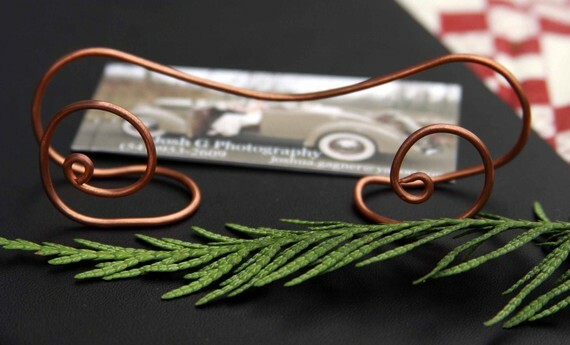 Our last/final featured store is called HomeAndWeddings and they feature stylish wire decor for your special events. They're giving one of our players that really cool copper wire business card holder you see pictured above & another lucky player will win a grab bag of awesome goodies donated by our past sponsors....how cool is that?!!!! In order to get in one of these prizes, just visit the store, pick your inspiration, make whatever creation your heart desires & link it to the EtsyInspiration Challenge Blog by Friday, July1, 2011 @ noon Pacific time. Thanks so much for stopping by & I hope you all have a wonderful rest of the weekend. I'll be back on Tuesday with another post. LOVE your card. I am really into banners and I am loving yours. Is that a new stamp set I see? Great colors too. I will miss your etsy inspired creations! Happy Saturday, Jackie! Your challenge card is wonderful, Jackie! I love the texture of that embossing, and those colourful banners. I've really enjoyed seeing the amazing creations you come up with from the Etsy challenges. What a fun banner card! I love the little metal accents too...perfect for your inspiration pieces. Jackie, it has been a pleasure to be on this team with you. Your kind spirit shines through in all your posts. I hope to continue to 'see' you in blog land! Love it Jackie - very pretty card. I will miss your etsy saturdays - but I am sure you will keep offering lots of fabby inspiration! What a great bright fun cheery birthday card!! I love those new punches and set! Love this Jackie! 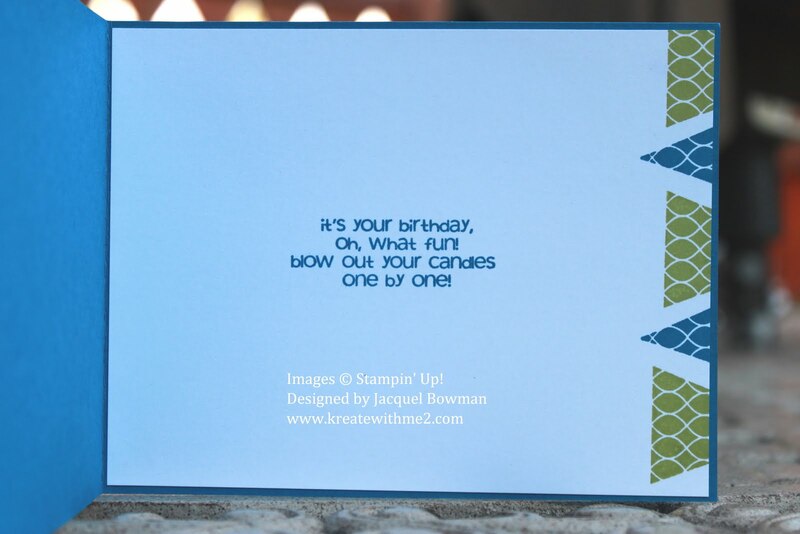 Great colors, wonderful stamping. Very well done. Very cute, love the embossing and I love what you did with the inside! Super banner card, Jackie! I have not done anything with banners (yet) but your adorable card sure is inspiring! Nice color choices, too! This is great, love the banners with the embossing. You made a really fun card to match the inspiration. I love your card!! Your work is amazing and I am so glad to have been on the team with you. I hope you keep in touch! I love your card! The banner is adorable! You do such a beautiful job with these challenges!!! I really like how your stamping carried over to the inside...I should do that more often. Don't you just love the square lattice embossing folder? Beautiful! Your card is great. 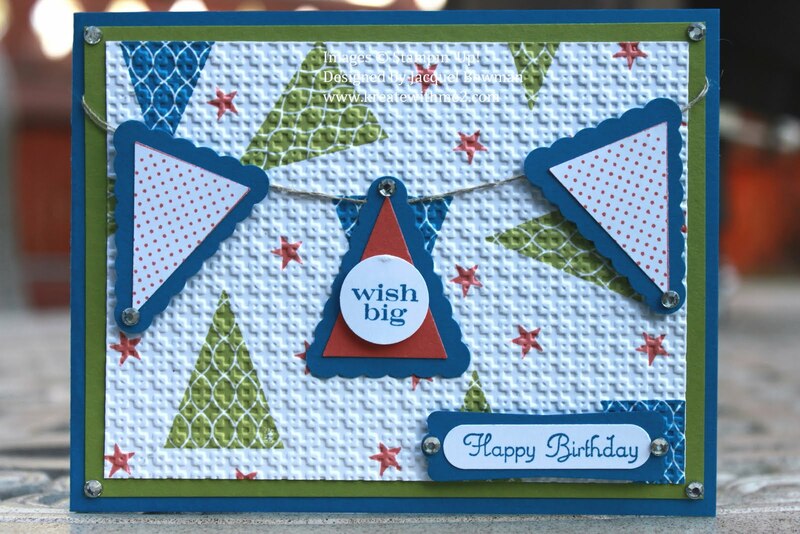 The embossing of the background really sets off the pennants. Terrific texture. I love the blues and the pennants. Festive and cheerful card! Ooooh, I loooove your banner card, Jackie...the colors are so bright and happy and the texture looks awesome!!!! Super cute! I need to get that punch!!! Love your fabulous embossed background for this fun banner!! Sensational birthday card, Jackie! This birthday card is soooo much fun!! I love the festive flags and the embossing!! It has been such a joy and pleasure designing with you!! I have loved meeting you, and watching you grow as a designer and see your lovely creations every week!! Keep up the fabulous creative endeavors!